-----For us, this was the second leg of Le Grand Circuit Nautique -- 800 nautical miles of scenic waterwayy that encircles northeastern New York and southern Ontario. 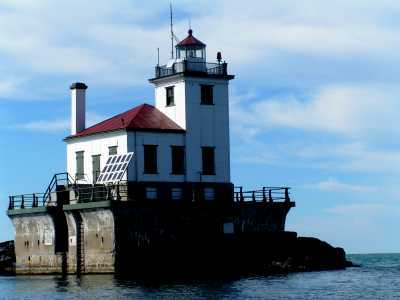 --- T This leg is a journey across Lake Ontario, from Oswego, NY to Kingston, ON, a stretch of notoriously rough water. The east-west orientation of the lake allows a very long fetch for the development of large waves from the dominant westerlies. Your course is almost north, so the passage is often with a beam sea (our most uncomfortable direction). --- T Patience, patience, patience. Watch for the weather window. We waited out the 40-knot winds and 8-foot waves, and then the next day, late in the afternoon, we had our break and headed for Canada. --- T It doesn't matter how many times one has crossed open water. The excitement and the thrill before departure is always the same. We have heard the same from a friend, a commercial airline pilot, who said, "When the time comes that my pulse doesn't increase before takeoff or landing, then it is time to retire." --- T We checked the radar for conditions to the west, listened to our friend Arnold, the computer voice on NOAA radio who has advised us on so many passages, sniffed the breeze, listened to those 'wee small voices within,' and with a "Let's Go," from El, headed the bow toward the open water. 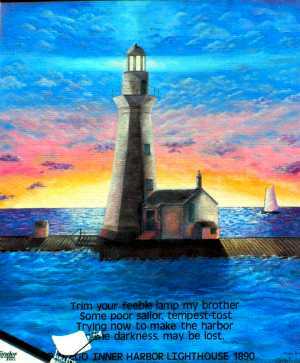 --- T Oswego, thoughtfully, provides a large mural on the side of a building, right at the departure point, that gives one that last moment of pause -- "...may be lost." Thanks, Oswego. If our wind and seas held as predicted, we would make Kingston with an hour of daylight to spare. Too close for us prudent sailors, usually, but the forecast for the next three days did not look good. We have radar and good navigation systems, and are familiar with night passages, so darkness would only be a problem finding the entrance channel into Confederation Harbour in Kingston. We knew it to be well-lit, and could always anchor out in a lee near the harbor if necessary, so off we went. Little did we realize that we would receive a Mayday call before reaching our destination. 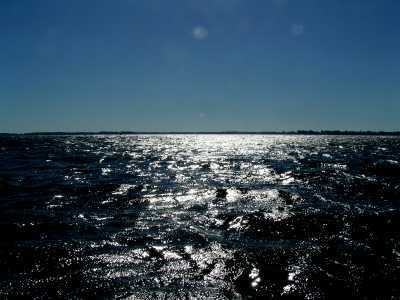 --- T We could feel the lift of the bow on the long swells left over from yesterday's gale, and it made the heart throb. Astern were the tall twin towers of a power plant that serve as a convenient mark for southbound cruisers, and to our east was a huge 'jug' spewing steam high into the air -- the cooling tower of a nuclear power plant. The angle of ascent of that plume is a sailor's best dream. What a wind indicator! -- both for speed and direction. We set our new engines for a comfortable speed of 15 knots. 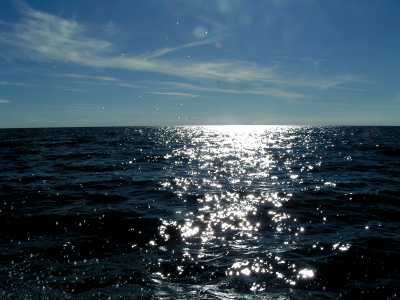 There was not a boat in sight in any direction -- "alone, alone, all alone; alone on a wide blue sea." It is a feeling we enjoy. --- T It is about fifty miles across Ontario, on this crossing. With our afternoon departure, and late season, the sun slowly sank toward the horizon. After the first hour, El took out a good mystery book that has engrossed her during our quiet times. --- T Life is like a peach -- just when biting into the juicy tidbiit you crunch on a pit. So it was with our passage - shortly after we sighted the welcoming shore of Canada, the wind sharply increased and Canada Coast Guard broadcast a small craft warning. 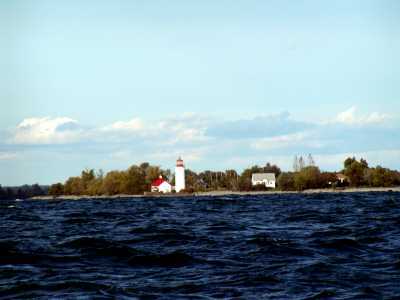 We soon had a rising sea astern but we quickly ducked behind Wolfe Island for more protection. Just as the waves began breaking into white caps, the radio began whistling the Coast Guard warning call, and we soon heard a Mayday. A small boat was sinking and required immediate help, but they gave no latitude/longitude and only a general location, along our route. Soon we, and a Canada Coast Guard rescue craft, were searching but we found nothing, and when the Coast Guard returned to harbor with the rising sea so did we seek the entrance to Kingston. Shortly, we were tied to the welcoming dock in Confederation Harbour. We never heard the result of the Mayday.